This little tool is fairly new to my stash of goodies. I have been using safety pins to feed my cords, ribbon, and elastic through casing ever since I can remember. 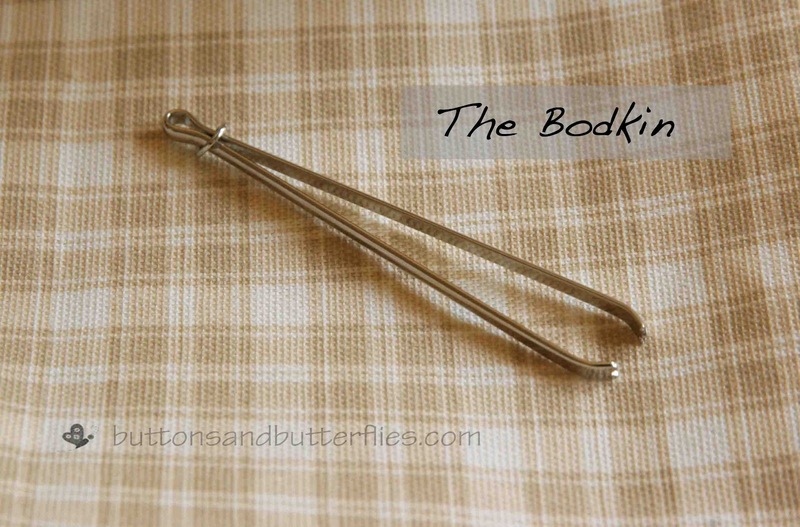 I have heard of bodkins before, but never had the urge to buy one. I finally did this summer and love it! As you can see above, it is like a pair of tweezers. 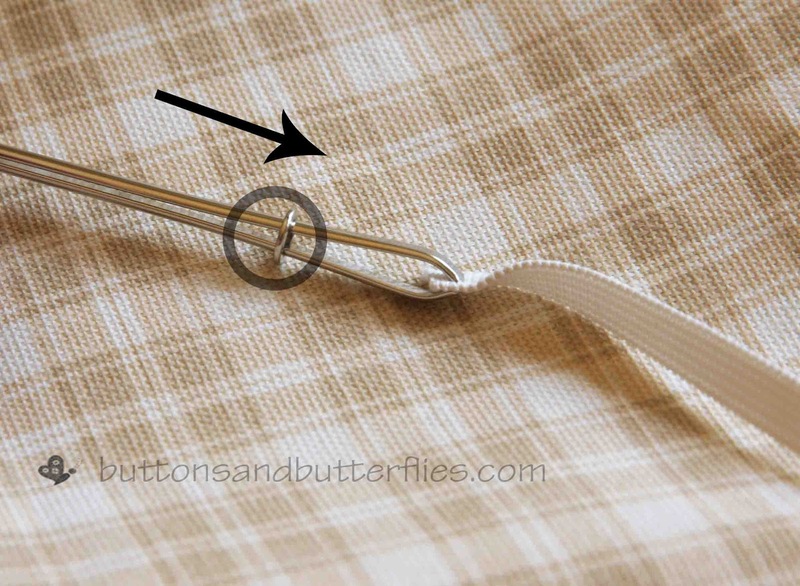 You grab the end of your elastic/cord/ribbon and then slide the small ring towards the end. It gets nice and tight! You feed it through the casing with the rounded head first and your elastic/cord/ribbon trailing behind. I like how it is rounded at the end and slides through the casing nicely. I also like that it is longer than a safety pin and substantial enough to feel it through the thickest of materials. One note, because I think this is one of the most important tips when you are feeding something through the casing. I know I said it yesterday, but I will say it again....pin the end of the item you are feeding to the edge. It will save you a lot of heartache! There are a few brands of bodkins out there. 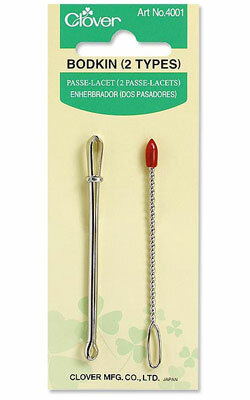 Some actually look like large plastic needles that you place the elastic in the hole with. And Clover has a twin set. But if you have a Hobby Lobby nearby? Get yourself one if you have a bit of room in the budget!!!! But if you want to continue using your safety pins...I promise...I won't judge!!!! that's too awesome! I hate threading with a safety pin. Is it small enough for small elastic/casings? I think it would go through as small as a 3/8-1/2 inch casing? it is definitely skinnier than most of my safety pins! I have seen those in stores and not paid much attention because I had no idea what they were for! I hate when my elastic gets eaten by the safety pin on the way through, or once my pin opened up as it was going passed a seam, that was a pain to try to get it done up so I could get it out of there (it was stuck). Ohhhhh. Have totally been there! The worst!!!! I was wondering what in the world you were talking about when you said bodkin, so thanks for the post. 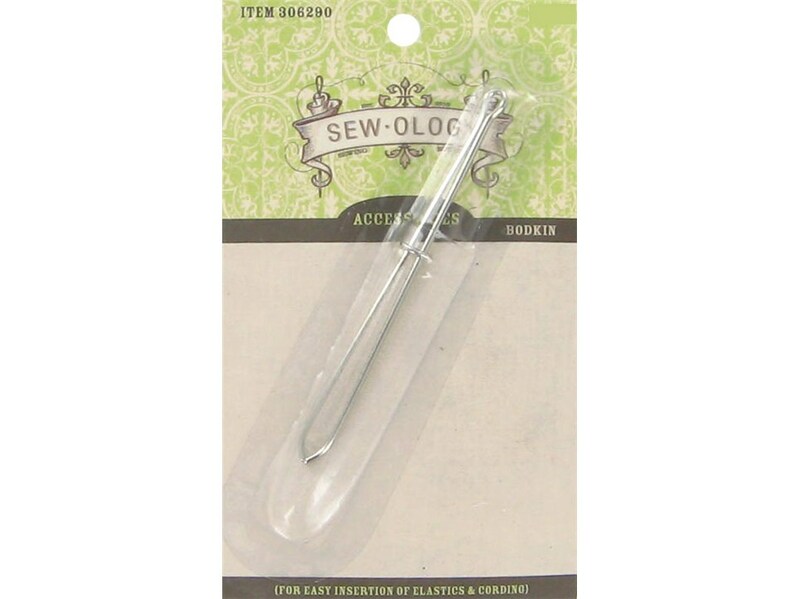 I have some crappy elastic threaders but I think I'm definitely going to pick up one like yours next time I am at Hobby Lobby that looks so much easier to use!